A new version of the Dictionary was published on 9 December. For the first time, this version runs correctly on Android phones and tablets. In some browsers (e.g. Chrome and Firefox) explanations of the grammatical and bibliographic abbreviations cannot be seen when tapping on them (as is possible on a normal computer or on iOS devices) but these will work with Android browser itself (the ‘minibrowser’ or ‘open-source browser’). Hopefully this version is much easier to use on Android devices. The new version of GPC Online running on Android. 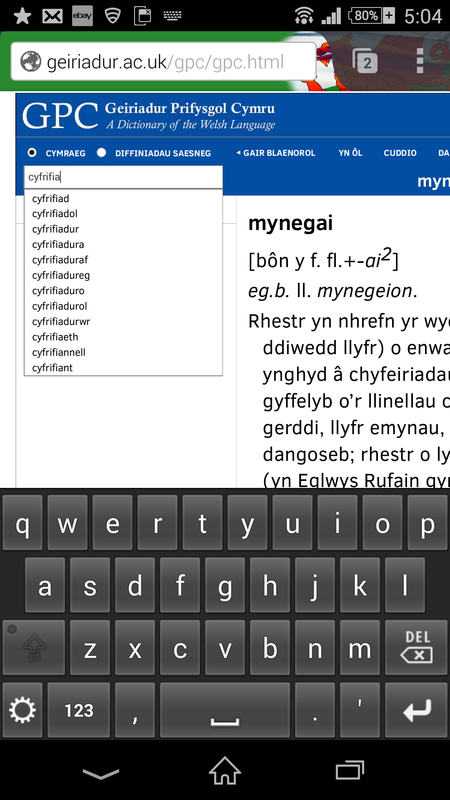 This version also improves the process of searching by taking into account the Welsh mutations. From now on, if you search for a word, the results which are shown on the left will include combinations (or collocations) containing mutated forms of the word. 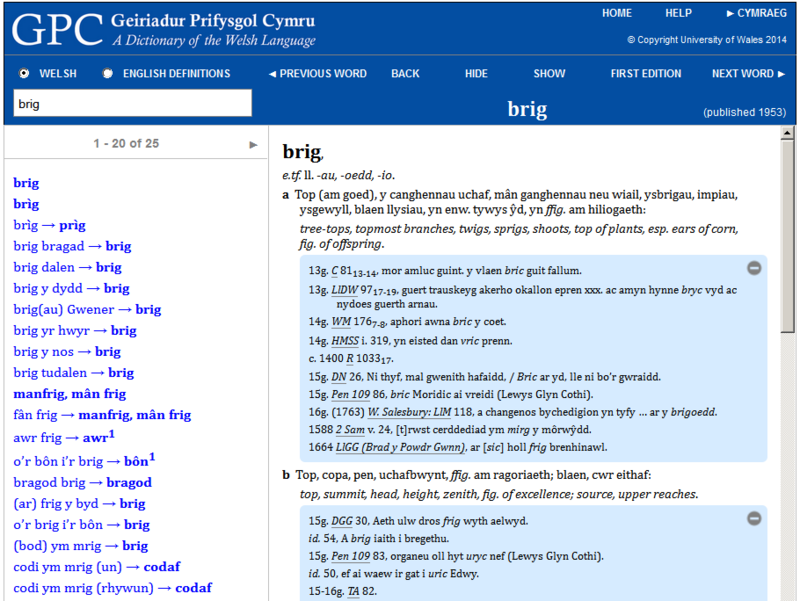 For example, if you search for ‘brig’, you will find such collocations as ‘awr frig’, ‘codi ym mrig’, and ‘mân frig’ as well as ‘brig yr hwyr‘ and ‘o’r brig i’r bôn’. The results of a search for ‘brig’ showing mutated forms. GPC attempts to follow the orthographical (or spelling) guidelines in Orgraff yr Iaith Gymraeg (3rd ed., Cardiff, 1987). The spelling of certain words in this version has been changed to comply with the latest interpretation of these guidelines (for example, ‘caeëdig’ has been changed to ‘caeedig’). If you search for a word in non-standard spelling, GPC Online now tries to refer you to the standard spelling. For example, if you search for ‘adborth’, the spelling ‘atborth’ will be suggested. Click on it to see the full record. The data available has now been corrected and standardized. Tens of thousands of minor changes have been made in the data in an attempt to facilitate searching, some typing errors have been corrected, and the consistency of the work improved. No new words, new meanings, or new collocations have been added to the data this time. It is intended to publish the next batch of brand new entries in about three months’ time. The majority of these will be relatively new words which became common after the publication of the relevant parts of GPC. Thanks to everyone who has commented, corrected errors, or supplied us with new evidence. 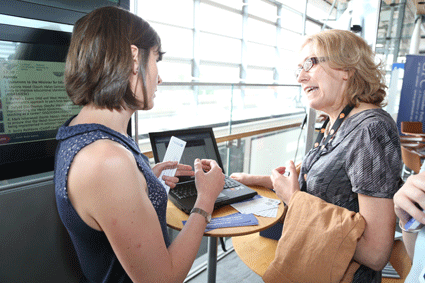 You can contact us in various ways, click here or on the ‘Contact‘ page. 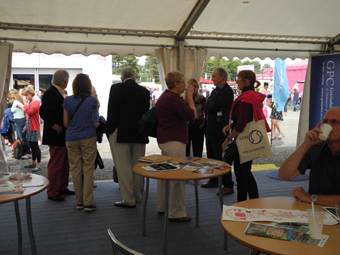 During a lively week at the 2014 National Eisteddfod in Llanelli members of the Dictionary staff worked at the University of Wales stand. A number of friends dropped by to see how to use the online Dictionary. 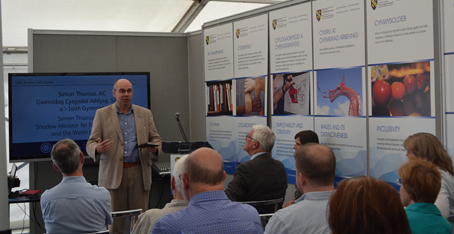 On Friday afternoon Arwel Elis Owen and Simon Thomas, A.M., came to the stand to give a short address on the importance of publishing the online Dictionary and of securing public support for it. 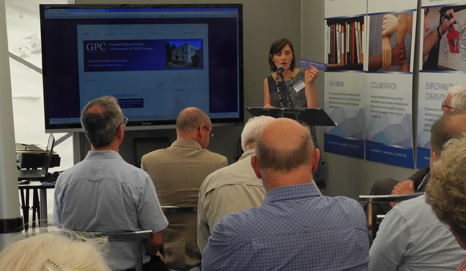 The audience had the opportunity to hear Angharad Fychan, one of the project’s Senior Editors, explain how to use the Dictionary’s new website. 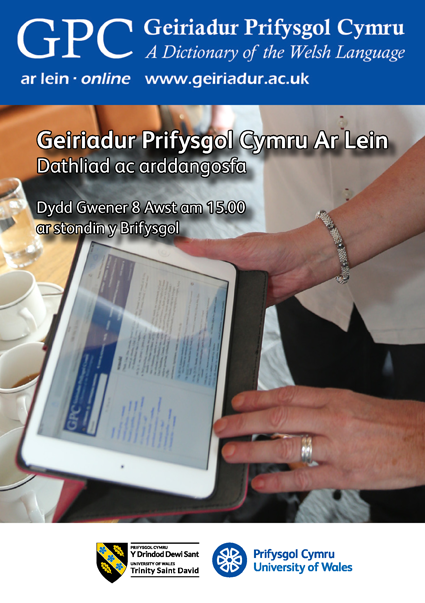 To learn more about the Online Dictionary and how to use it, come to the University of Wales tent at the National Eisteddfod (number LL04, opposite the pavilion) on Friday 8 August at 3pm. Following the highly successful launch of our new website and Online Dictionary on June 26th, our two senior editors, Manon Roberts and Angharad Fychan, are seen here giving a live demonstration. 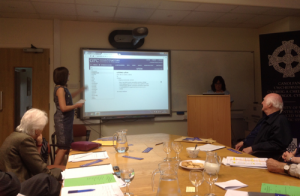 They presented the new ‘app’ at the July 4th meeting of the CAWCS Advisory Committee where they gave an introduction and step by step guide to the many features and versatility of the freely available Online Dictionary. 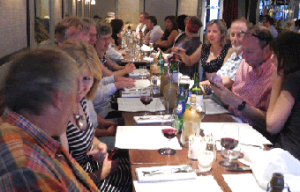 The informal session was warmly received by the committee members who recognised the effort and hard work put in by GPC and our associates, iLEX Digital Publishing, in order to create our new online presence. After three years’ work, GPC Online was launched by the First Minister of Wales, Carwyn Jones, AM, in the National Assembly, on 26th June 2014. 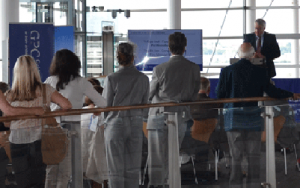 The period before the launch saw intense activity here at GPC and the day before the big event the staff went to Cardiff to ensure that everything was set up and working correctly for the ceremony. 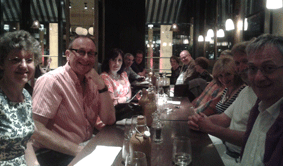 After all the preparation, having assured ourselves that all was as it should be, we took the opportunity, with colleagues, to relax and unwind at a pre-launch supper at the Cote Bistro in Cardiff Bay. 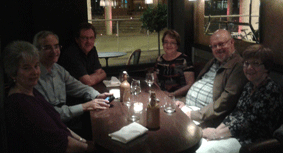 GPC staff & colleagues relaxing before the big day. The launch at the National Assembly. 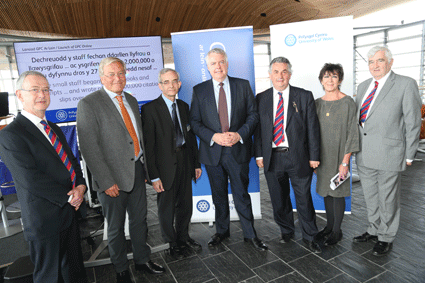 Professor Dafydd Johnston, Jens Erlandsen, Andrew Hawke, Rt Hon Carwyn Jones AM, Professor Medwin Hughes, Meri Huws and Alun Thomas. 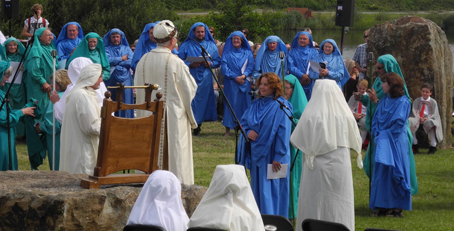 The launch ceremony itself went very well with the new web site and online dictionary being enthusiastically received and welcomed. 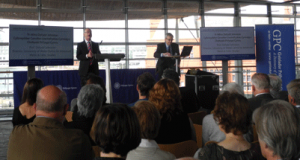 Carwyn Jones, AM speaking at the launch. Professor Dafydd Johnston & Andrew Hawke at the launch ceremony. 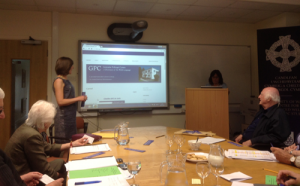 Word spread rapidly with GPC Online attracting 10,251 visitors to its search page on that first day. 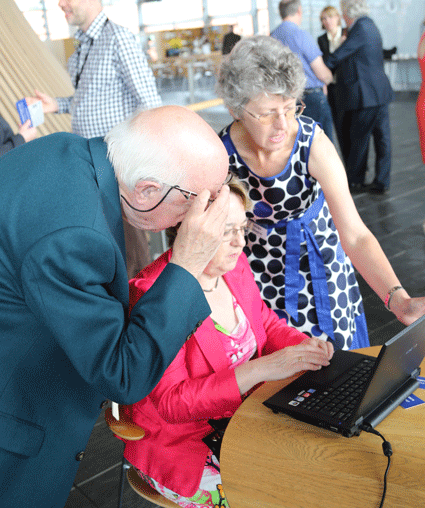 After the official part of the proceedings was over Dictionary staff members were on hand to personally demonstrate GPC Online to the guests and to encourage those who wanted to ‘have a go’. Senior Editor Manon Roberts demonstrating how to use GPC Online on an iPad. 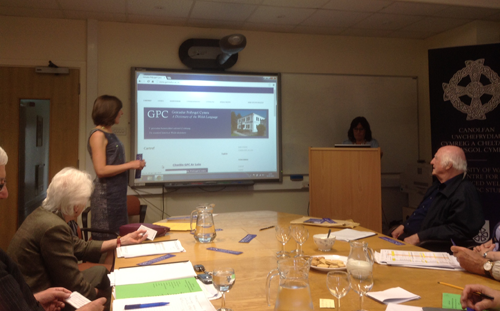 Senior Editor Angharad Fychan explaining the features of GPC Online. 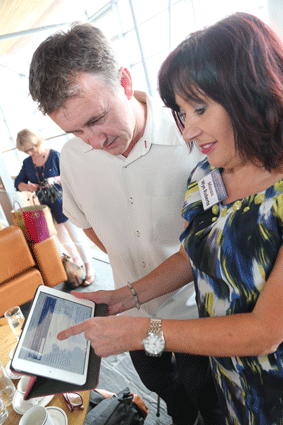 Assistant Editor Brenda Williams encouraging guests to ‘have a go’. The GPC Online project represents the culmination of several years’ work that makes this acclaimed historical dictionary freely available to one and all for the first time. 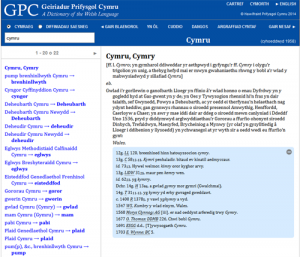 Not only a research tool for scholars and academics, or a reference for schools and government departments, GPC Online will be invaluable to anyone with a desire to learn more about the Welsh language and its rich history. GPC staff & friends at supper. Bunt boeth, yn gyfoeth heb gur. These are exciting times, and the Dictionary is evolving to meet the needs of the modern user. The ways in which people access and use information have changed dramatically in recent years and, here at GPC, we’ve worked hard to improve accessibility and availability for a new generation of users. system, and to produce an online dictionary. 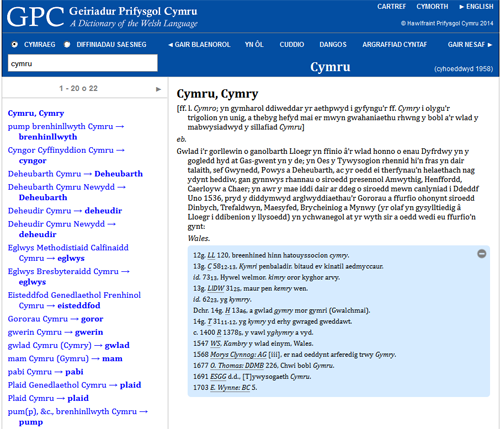 This free online version will permit searching for English words as well as Welsh words and expressions. 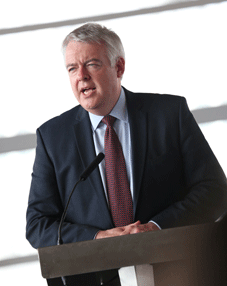 It will be an invaluable resource for all those interested in the Welsh language.